Large (Wide Mouth) Opening, Double Wall Vacuum Insulated. Design In Mind: With It's Easy-Access Wide Mouth, The Sleek Design Holds The Same Volume Of Liquid As Other Leading Water Bottle Brands. Also, Safety Is Top-Of-Mind, As The Bottles Are Made Out Of Non-Toxic Plastics & 18/8 Food-Grade Stainless Steel. Slip-Free Grip: Unlike Other Leading Water Bottles, Hydro Flask Has A Powder Coat, Which Gives You A Solid Grip. The Powder Coat Works With The Premium Tempshield Insulation, Which Prevents Condensation From Forming On The Outside Of The Bottle, To Give You Exactly What You Want In An Everyday Refreshment Delivery System. Fits Standard (not wide-mouth) HydroFlask Bottles. Black Dutch Bros 2 0 oz wide mouth H ydro Flask. Lid with flip top and straw. 2 small dents and 1 scuff on bottom. DESIGN IN MIND: With it's easy-access wide mouth, the sleek design holds the same volume of liquid as other leading coffee thermos brands. Also, safety is top-of-mind, as the bottles are made out of non-toxic BPA-free plastics & 18/8 food-grade stainless steel. SLIP-FREE GRIP: Unlike other leading coffee thermoses, Hydro Flask has a powder coat, which gives you a solid grip. The Powder Coat works with the premium TempShield insulation, which prevents condensation from forming on the outside of the bottle, to give you exactly what you want in an everyday refreshment delivery system. Keep life moving with our 21 oz bottle and Standard Flex Cap. Compatible with Standard Mouth Insulated Sport Cap. Durable 18/8 Pro-Grade Stainless Steel construction. Weight 11.3 oz. Hawaii Shave Ice Hydro Flask 32oz Hawaiian Rainbow Limited Edition New. Condition is New. Shipped with USPS First Class Package. 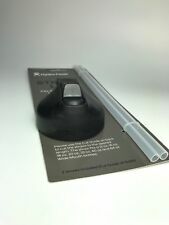 This straw lid is a great accessory for your Hydro Flask or other WIDE MOUTH Stainless Steel bottles. It fits all size Hydro Flask and Hydro Flask type water bottles. Simple twist on, cut straw to your length water bottle. Authentic Hydro Flask 22 Ounce Tumbler. Color: Raspberry. Size: 22 oz. Danner 1932 Hydro Flask 20 oz Wide mouth with Hydro Flip color Grey. No returns. Hydroflask 32 oz Insulated. Condition is Used. Shipped with USPS Priority Mail. Hydro flask 32 oz wide mouth. Condition is Used. Purple/pink color. Didn’t use as much as I thought I would. 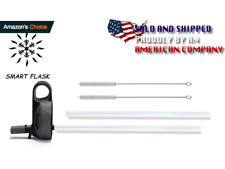 Shipped with USPS Priority or ground mail. Black Hydro Flask 64oz 1.9 Liters Growler Stainless Insulated Water Bottle. Condition is Used. Shipped with USPS Priority Mail. Hydro Flask Flat Cap Lid Fits All Wide Mouth Bottles. Fits all Wide Mouth Bottles including: 12oz., 16oz., 18oz., 20oz., 32oz., 40oz., 64oz. 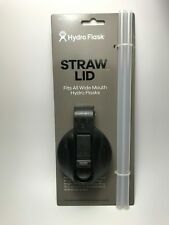 Hydro Flask Flip Cap Lid Fits All Wide Mouth Bottles. Fits all Wide Mouth Bottles including: 12oz., 16oz., 18oz., 20oz., 32oz., 40oz., 64oz. Condition is New. This large insulated water bottle is great for long adventures! Bottle fits most back country hydration filters. Hydro flask flip lid. Fits on all wide mouth sizes 18oz, 32oz & 40oz bottles.